-- This is such a wonderful idea! 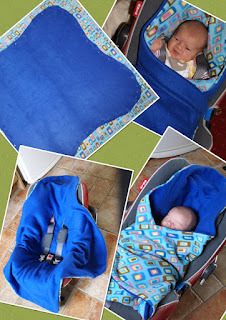 It totally eliminates the need for a winter coat for baby, making school runs and other outings so much easier. It is easy enough to make, that you could even hand sew - if you don't have a sewing machine! 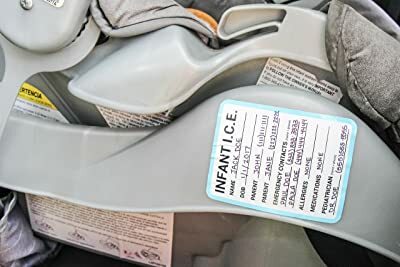 -- Place Emergency Contact information stickers for rescue workers on BOTH sides of every stationary car seat in your car. Include your child's name, phone number, etc. In the event of a wreck most children in car seats can't or won't be able to give this information to rescue workers. IDEA! What about a plastic pocket attached to the bars of the seat, that you could change out the information when necessary? Would be helpful for updating child's info, or if another child uses the seat. IDEA! Print out the information on the back of a photo, so the Emergency people would know they had the right child. IDEA! Laminate an index card with the emergency info on it and use one of those luggage tags to attach it to the car seat. So it's not permanent, when your child moves to a new seat, the card goes with them. Check Amazon for Car Seat Safety Stickers. Pour about 1 cup of baking soda into a mason jar and drop in 4 drops of lavender essential oil. Put on lid and shake jar. Using a kitchen strainer (or just poke holes in the mason jar lid! ), sprinkle the baking soda mixture all over the mattress and let it sit for an hour or more. Thoroughly vacuum the mattress. Bye, bye dust mites and other nasty things. The baking soda helps draw up any moisture and deep dirtiness. It deodorizes, and leaves the mattress smelling fresh and clean. IDEA! Works on couches too - especially if you have dogs that like to sneak up on your couch when you are not home. 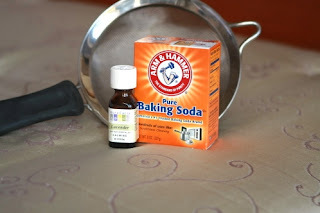 Check Amazon for baking soda - 101 cleaning uses!